My holy of holies is the human body, health, intelligence, talent, inspiration, love, and the most absolute freedom imaginable, freedom from violence and lies, no matter what form the latter two take. Normally, I write about subjects that are generally of interest to me when I do a blog post: you may have seen the list before. So I’ll have to start out this post with the admission that until I was leaving the office on Monday, I had no idea that the Boston Marathon was going on that day. I had no clue that the estimate of the number of spectators would be over half a million people. I didn’t know that the third Monday in April is Patriot’s Day in Massachusetts and Maine. And I didn't know about the explosions at the finish line until I turned on the news. Now the whole world is aware of these events, and all of us at Minitab are shocked and heartbroken about the harm inflicted by this despicable attack. In following the subsequent news coverage, I've seen many people talk about piecing together facts to understand what happened—and why. That's important, but I've started to think that the most important motivations from Monday, April 15th 2013 weren’t about detonating devices. The important motivations are those of the people who attended and participated in the race for reasons we already understand: to improve society. I’m always curious about numbers, and there are certainly a lot of statistics about the Boston Marathon. Without losing sight of the events that are dominating the news, the most meaningful numbers to me are ones that speak to the good the participants and supporters of the Boston Marathon do, such as the amount of money raised for various charities that were sponsored by John Hancock on crowdrise. Here's a boxplot of that data and some notes about a few statistics of interest. When raising money, the sum is always an exciting statistic. The pictures with the teams on crowdrise have a total of $6,333,927 raised for charity. The Boston Marathon Official Charity Program and the John Hancock-sponsored charities expect to raise more than $16,000,000 in 2013. And many other charities raise money during the marathon without sponsorships from these two organizations. The boxplot uses asterix symbols for teams that raised exceptionally large amounts of money on crowdrise compared to the other teams. 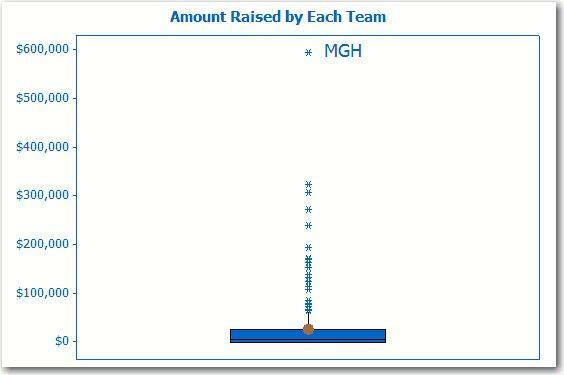 The maximum in the data set belongs to the 105-person team from Mass General Hospital for Children, with $593,449. That's an achievement to feel good about. For the 250 teams in the data set, the mean raised was $25,336. Multiply the mean and the number of teams and you’ll get close to the sum, which is my favorite thing about the mean. In this data, the mean is approximately equal to the third quartile. The mean is shown on the boxplot by the tangerine dot. Half the teams in the data set raised over $5,725 on crowdrise. On the boxplot, the line that divides the box is median. I picked these numbers to share because the data was convenient to get. But there are a lot more good stories and numbers about the good that people were doing on Monday. Like most of you, I will be following the news about the sorrowful events that took place, and I will do what I can to help in some small way. But I’m also going to keep thinking about all the good that people achieved at the 2013 Boston Marathon, and I hope you will, too. 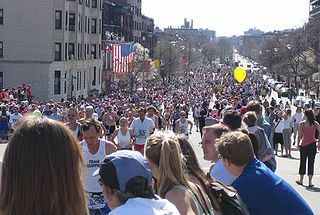 The image of the 2005 Boston Marathon is by Pingswept and licensed for reuse under this Creative Commons License.